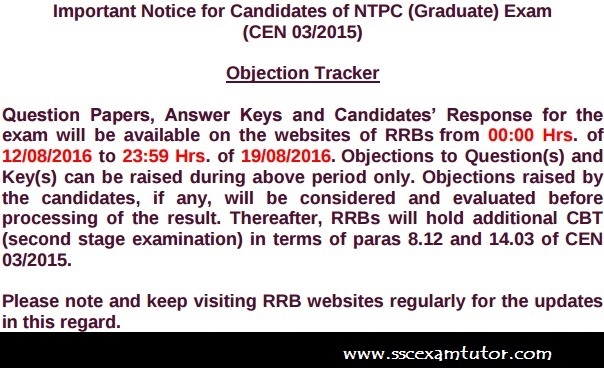 RRB NTPC Official Question Paper and Answer Key 2016 (CEN 03/2015). Railway Recruitment Board conducted Non-Technical Popular Categories computer based tests between 28th March, 2016 to 30th April 2016. A large number of candidates appeared in this Exam and they were eagerly waiting for the result. Unfortunately, RRB has not declared the result yet. However, they have uploaded the official Question Paper along with the answer keys and your attempts. So, you can calculate your marks based on this answer key. Please note that, there can be some wrong answers in the answer key as well. In that case, you can file an objection till 23:59 of 19/08/2016. For checking your answers, You will have to log into your account by entering your Registration ID and Date of Birth. Click on below given link for accessing the login page. The official notification regarding the objection has been posted below. you can check that.